This fun little game allows students to live out their dreams as criminal-busting detectives out to search for suspects with a little bit of clever guesswork based on clues. Students are asked to enter values between two whole numbers, demonstrating that these two numbers can be further subdivided. 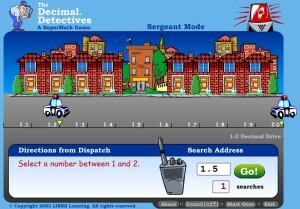 Each guess sends a police dispatch to the area, where a witness would inform the player which direction he believes the suspect had been seen (left or right). There are two levels of difficulty – the easy version lets players guess within 1 decimal place, while the harder requires a more difficult-to-guess 3 decimal places. 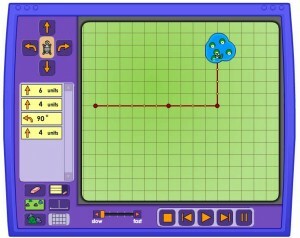 The game also has a two player mode, where each student is allowed to hide their badge in a given decimal point (while the other is not looking). The player who finds his opponent’s badge by observing the game’s character behaviors as he makes his guesses wins the game. 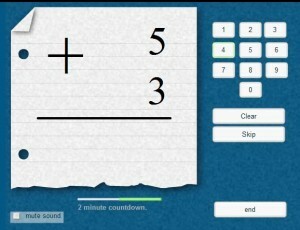 A math challenge that can be played by many different levels, Math Fact Practice pits students against the clock as they try to answer as many addition, subtraction, multiplication, and division problems as possible. 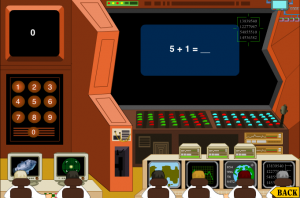 Teachers are provided with many customization options at the beginning of the game, depending on their students’ education level and how difficult they want the math questions to be. To add a further challenge, they may also opt to divide the class into two or more groups with representatives; whomever gets the most correct answers within the given time wins the game. At the end of the game, aside from reporting how many numbers were answered, teachers are also presented with the students’ average computation speed for every operator, helping them adjust their teaching accordingly. Click on the correct answer to the math problem and you will see the space shuttle launch off. Playing jeopardy in your classroom can be loads of fun! 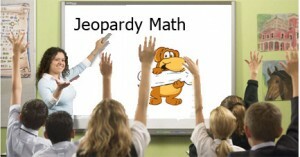 However, many teachers find they don’t have the time to setup a jeopardy game the instant they need it in class. This is where Jeopardy Math Game comes in. It has yet to be launched, but it looks very promising, so make sure you sign up now.